Andy Bergholtz wins 3 T-shirts from our range for submitting this great Rocky inspired image into our Best Picture of October Competition. 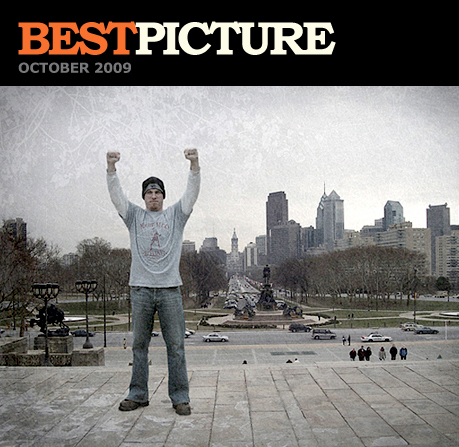 The shot was taken outside the Philadelphia Museum of Art in Philadelphia – also known as the ‘Rocky Steps’. 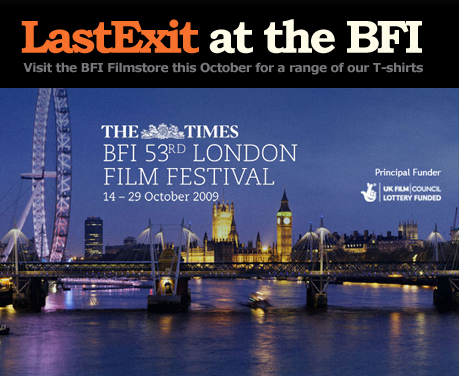 Try entering our November competition for a chance to win 3 T-shirts too – simply send your idea featuring or wearing a Last Exit T-shirt to us at info@lastexittonowhere.com for a chance to win. Good luck team. 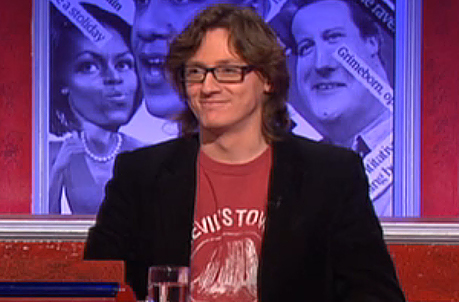 Ed Byrne looked the part again wearing our Close Encounters of the Third Kind homage T-shirt ‘Devil’s Tower, Wyoming’ on the BBC’s satirical panel show ‘Have I Got News For You’ on Friday. English naturalist, nature photographer, television presenter and author Chris Packham was spotted wearing our Tyrell Corporation T-shirt on the BBC’s brilliant Autumnwatch 2009 (Episode 4). Brand new T-shirt design inspired by the fictional town in the film First Blood. 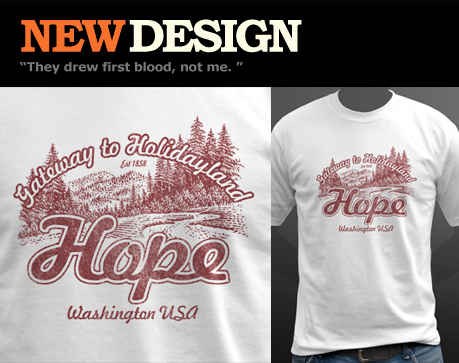 ‘Hope, Washington’ pays homage to the first and arguably the best story in the Rambo series. Click image for further info. A selection of Last Exit to Nowhere T-shirts will be available to buy this year at the The Times BFI 53rd London Film Festival from the 14th – 29th October. Click on the image for further information about this prestigious event.